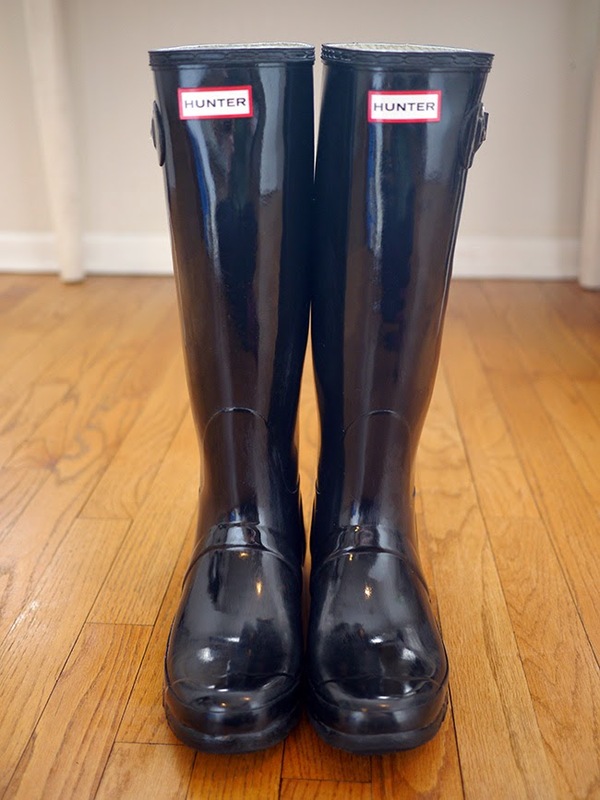 Have your Hunter boots lost their original shine? 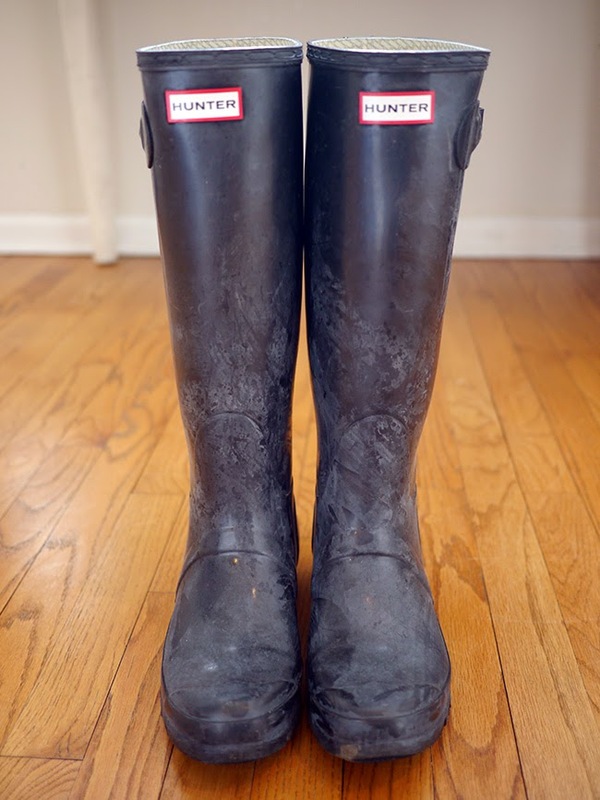 Hunters are made from real rubber, which goes through a process called "blooming" where the rubber expels certain particles, causing a white, powdery substance to appear on the surface of the boots. The original boots I tried on in stores had already bloomed (which the sales person was highly embarrassed about, he made me buy a shinier pair instead) so I knew exactly what to expect, I just didn't realize they would get so dull so fast! 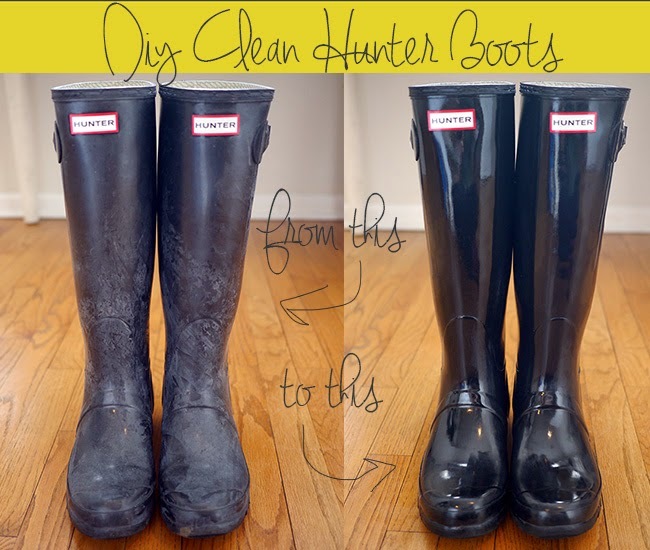 I was going to buy Hunter's boot cleaner, but then a quick Google search found a DIY way to get my boots clean. I was a little worried that I would get oil all over myself, but I was careful and just got a little on the floor. Once they dried they didn't feel oily anymore. Instead they were just super shiny and made me feel like a hundred bucks every time it rained in the last week. Wow they look brand new. I am definitely trying this! This is brilliant and probably better than the Windex I use when they look dull! No way! I knew mine had gotten duller over time, but now I realize how much! (We have the same color.) I need to do this! I m definitely trying this. WOW - this is amazing!!! 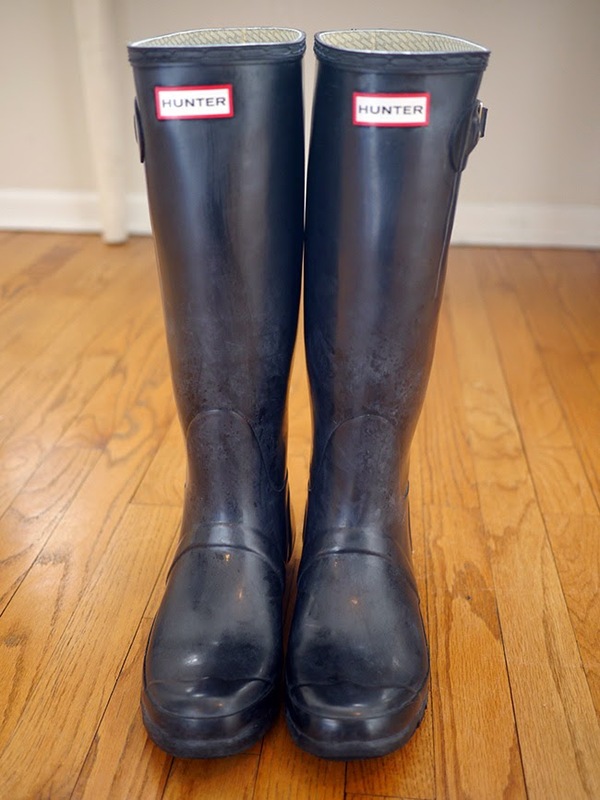 My hunters look like your "before" and I just hadn't gotten around to Googling how to fix it (or why that happens). I'm definitely going to do this. Thank you so much for sharing! Love this idea!! My Hunters are in need of some cleaning ASAP! Great idea! My pink hunter boots have been looking a little dull. I will definetly be doing this to my boots! Hey Ellen! Mine were the glossy style. Not sure how this would work on the matte! I shall test it out and report back. It's Spring here in Australia but we've had unseasonal storms and cold weather so I've had to bring the Hunters back out of hibernation. Thanks for the tips! Thank you so much for this post i just recently bought the same boots at winners and they are already dirty because of the rain in Toronto. I will subscribe to your blog just for this!! Another way to clean/condition rubber is to use glycerine. It's what I use on the door seals and other rubber bits in my car and on my boots.The oil looks nice, but I've never tried it. I have some flats made out of rubber and I had no idea this is why they would have a powdery look sometimes. I will definitely have to try this out! !